The Office of McFarlane Biggar Architects + Designers (OMB) has been awarded the prestigious Governor General’s Medal in Architecture for the design of Fort McMurray International Airport in Alberta, Canada. The bi-annual Governor General’s Medal in Architecture is presented by the Royal Architectural Institute of Canada (RAIC) with the objective of recognizing and celebrating outstanding design in projects built by Canadian architects over the past decade. The jury of five architectural professionals selected 12 projects to honor with the award. 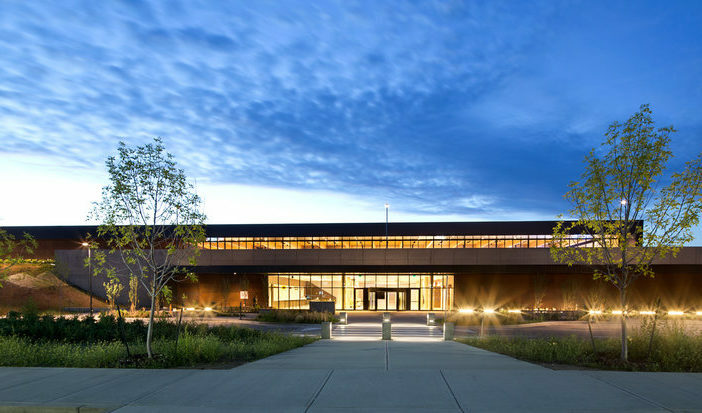 Opened in 2014, Fort McMurray International was built to support Wood Buffalo’s transitory workforce serving the oil sands and eco-tourism industries. The airport was designed to be both a gateway to northern Alberta and an expression of its place, occupying a unique position in the Canadian landscape. Arriving passengers are greeted with generous day-lit spaces with direct physical and visual access to a landscaped courtyard. Among the many interior highlights is a feature screen wall with faceted steel fins and programmable LED lights, which abstractly evoke the character of the Northern Lights and the regional Boreal Forest.